I have to admit, I am not big on stockings at all, but the more I see Blair Eadie wear them, and even with sandals, the more I love it. I felt brave enough to wear them with sandals too for Thanksgiving, and I LOVED how it turned out. You may see me wearing more and more stockings now😏. That’s the beauty of fashion for me… trying new things, experimenting, and stepping outside your comfort zone. Not every outfit will be your best, but at least you tried. 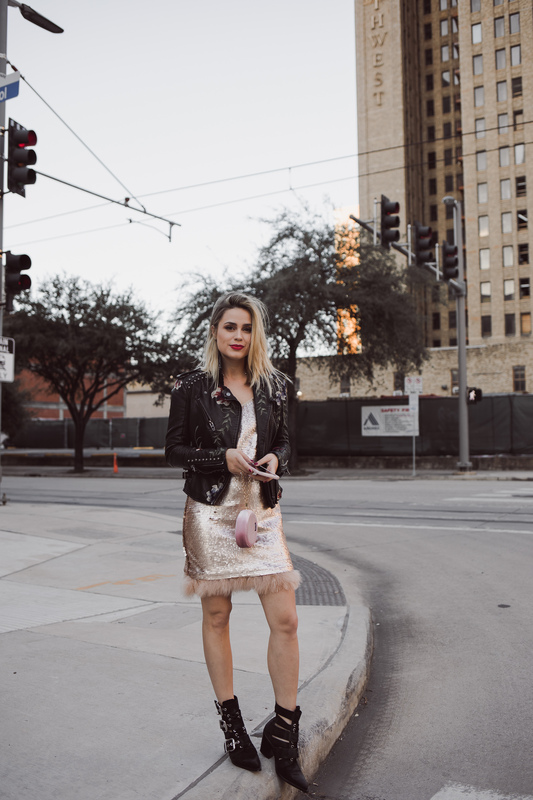 I think this sequin dress is perfect for the holiday season! So, here are two different ways to wear this sequin dress. First outfit; a whole lot of edge! What better way to make this feminine dress and pair it with moto boots and a leather jacket. Second outfit; because this sequin dress is very feminine, adding stockings along with a blazer keeps the look chic and even work appropriate! What look do you like best? Comment below! I love this article and your collection! Stop by and check out a few of my trendy styles also, Thanks! You have got such a beautiful smile. I really like your style. Thanks for sharing!